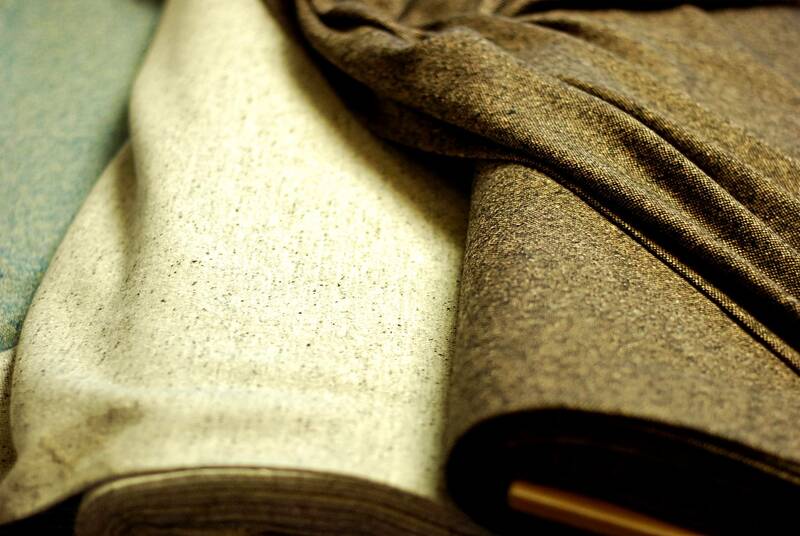 Luxury fibres like cashmere or vicuna can make lovely, indulgent cloths for sports jackets. Having mostly stuck to linen, tweed or related mixes in recent years, I recently commissioned a jacket in 100% cashmere (from Eduardo de Simone) and it’s striking how soft and sumptuous it felt. I had forgotten what the softness was like, and how nice a partner the short-haired texture can be for denim. And yet it’s also great for formal jackets. That recent commission was in a mid-brown herringbone, but I also have old cashmere jackets in navy (from Solito) and a pale-oatmeal colour (from Caliendo – all pictured below). The navy cashmere appears very smart when worn with grey trousers, a white open-necked shirt and dark-brown shoes – and yet doesn’t feel too formal or old-fashioned. The problem with cashmere, vicuna and similar fibres is that they don’t wear well. Being soft, they’re more likely to wear down at the elbows, or the cuffs. These jackets are a luxury in that sense as well, therefore: something to commission when you already have a range of harder wearing jackets in the wardrobe. There are ways to mitigate the fragility of cashmere, however. You basically want a cloth that has more body, the most important factor of which is the yarn (its thickness and how it is spun). However, the yarn is not something you can easily find out, so the best thing is to look for proxies – like the weight – and consider the weave. The best lasting will be a twill rather than a hopsack or plain weave, and a weight of 340g/11oz or above. I made the mistake of getting a lightweight cashmere with my navy Solito, which was only 9oz and has had heavy wear, leading to it balding a little on the elbows. Still, there are always nice suede elbow patches, right? 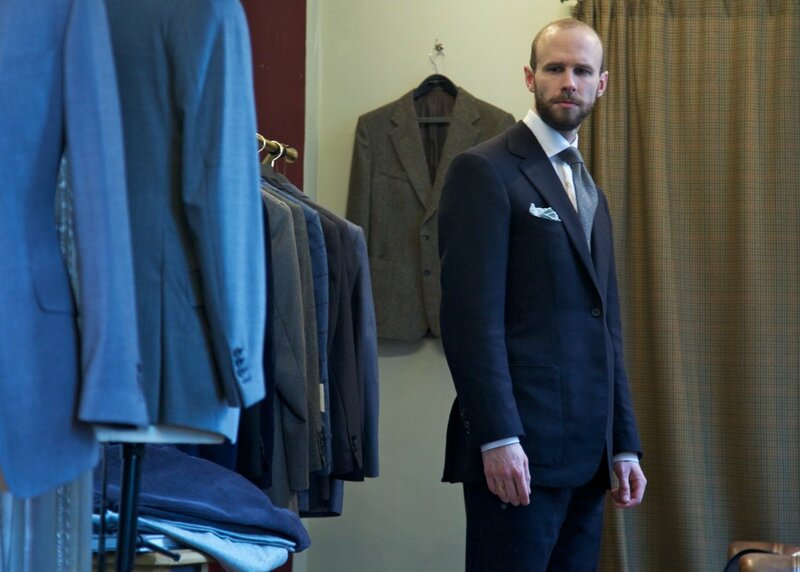 The softness of cashmere also makes it a poor choice for trousers, in general, and therefore for a suit. 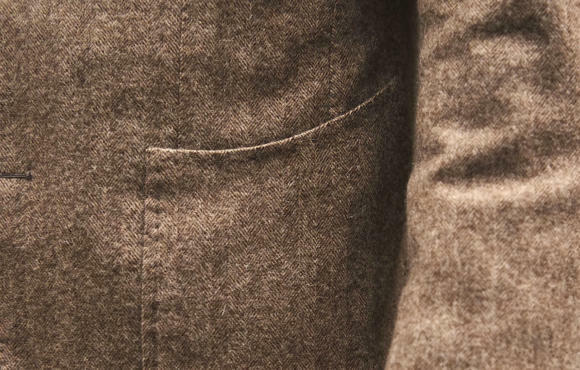 Trousers in pure cashmere are likely to lose their crease, then their shape, and finally start bagging at the knees. Again, it’s a mistake I’ve made before: with a navy suit from Vergallo. (If only this article existed six years ago!). The only exception to this rule is worsted cashmere. Most cashmere cloths are woollens, because the fibres aren’t long enough to make into a worsted yarn. But by selecting only the longest fibres, it is possible to make one. The problem is this makes the cloth more expensive, as it’s a further refinement of an already rare fibre. And a worsted cloth doesn’t necessarily have the softness you’d expect from a cashmere. When it comes to qualities of cashmere, there is a big range, with the best coming from Mongolia and cheaper versions coming from the rest of China, Iran or Afghanistan. But it’s very hard to tell them apart when selecting cloth, and in any case the ones used by the big mills don’t vary much. It’s just perhaps best to avoid precious fibres from unknown mills or merchants. The biggest problem with cheap cashmere, by the way, is the mix of fibre lengths, which is what causes pilling. If you see a friend with a cashmere jacket that has pilled heavily, you know to avoid the cloth. Other precious fibres like vicuna are so rare, and the supply so restricted, that there aren’t the same problems with quality. The only slight variation in vicuna is colour. The majority is caramel brown, and can therefore only be dyed darker colours than that. Much rarer is white vicuna, which can be dyed lighter colours. Other precious fibres include camelids like guanaco or alpaca. These are rarely used in menswear, and when they are it’s usually in a mix with merino. The finer types of alpaca approach vicuna in softness, however, and share the same properties of tensile strength and thermodynamic performance (retaining warmth). These include Sury (a rarer breed), Baby (an animal less than a year old, like baby cashmere) and Royal (the finest – baby alpaca with coarser hairs removed). 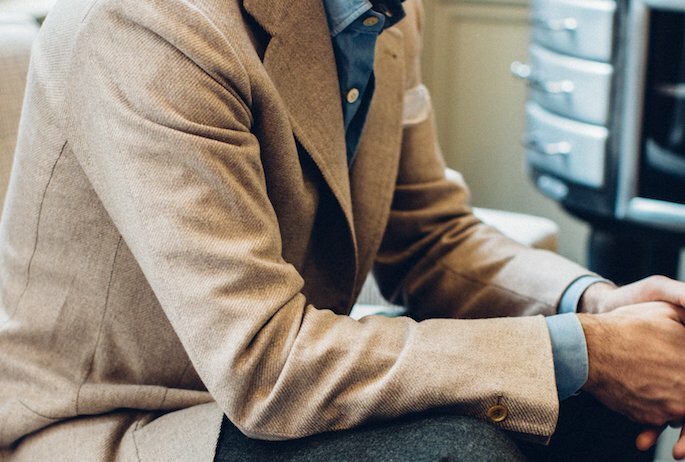 Cashmere jackets can be wonderful, but they do need looking after. Brushing a cashmere jacket or overcoat is particularly useful, as it serves to separate those short, soft hairs. Worth doing regularly. As to wool/cashmere mixes, the reason the cashmere is there is to make the cloth feel softer: some manufacturers will put a little cashmere in the mix to disguise fairly coarse wool elsewhere. So my advice is to feel it and see if it’s actually softer than a nice 100% wool, rather than just assuming it is. You can follow the discussion on The guide to cashmere and precious fibres by entering your email address in the box below. You will then receive an email every time a new comment is added. These will also contain a link to a page where you can stop the alerts, and remove all of your related data from the site. This is the most wonderful fabric knowledge site I have found in my search for knowledge and education on fabric! Thank you! I am considering a bespoke grey Overcoat. It would be a formal piece, to be worn over a suit in a business environment. My option was a mix of wool (85%) and cashmere (15%). Would you go for a 100 wool option? One more question, would you look for some pattern? Most of my trousers are grey, and maybe it would be a good way to make a difference. If it’s your one overcoat, which you will wear almost every day during the winter, then yes I would go for just wool. Otherwise, you can be more flexible. Zegna produces a jacketing book – huayaca tweed that is about 50% alpaca, 45% wool and 5 % cashmere. They seem to be the only major producer that uses alpaca consistently. I’ll try to remember to wear one to the NY symposium later this month. Sometimes, I bump into a wool fabric that is as soft as cashmere (without being a Super150+). I guess it is due to the finishing. Would you recommend those woodl as a proxy or do they not age well or wear harder than cashmere? Donegal cashmere and to a certain extend alpaca are not offered in a wide variety, sadly. It’s hard to say, but chances are that a wool like that would have been heavily milled or otherwise finished to feel like that, and no probably wouldn’t last well. Donegal cashmere is nice, yes, at least for the colour and texture variation. Not entirely relevant, but to be sure. Mongolia is an independent state, not part of China..
At the risk of getting well of topic for PS Mongolia is an independent country, Inner Mongolia is an Chineese province. Well, let’s not forget Inner Mongolia, which is in fact part of China, and also home to some of the better cashmere..
I’m sure this is unfair to the (I’m sure) hard working and dedicated herders of Inner Mongolia, but I don’t trust cashmere that comes from anywhere in China. Maybe it’s just an unconscious bias talking (my wife is Mongolian), but cashmere from Mongolia itself always seems to me to be of more consistently high quality than anything sourced from Inner Mongolia. Lovely to meet you very briefly as you were leaving Stoffa on Friday + thanks very much for the sweatshirt recommendations, feeling slightly self-conscious that I wasn’t better dressed that day haha! 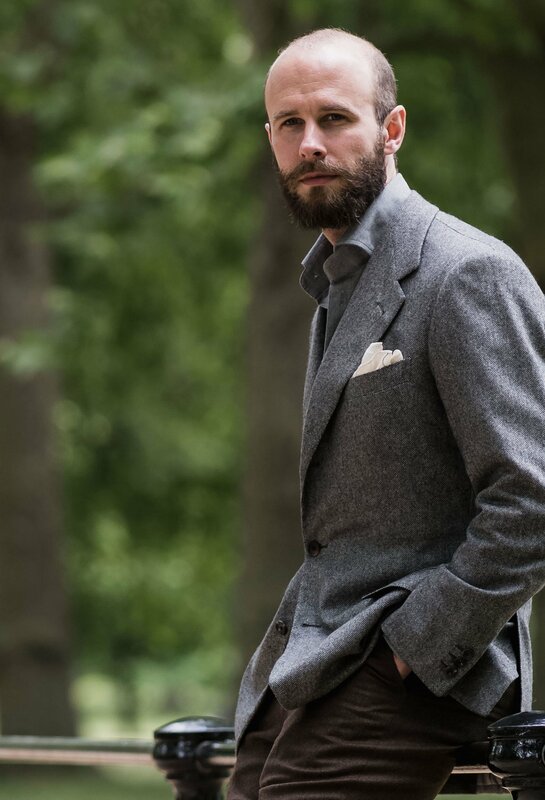 Just wondering, for a navy blazer that wears like your Solito but is slightly harder wearing – could you go for a wool instead, and if so which type? This is probably a slightly stupid question, but how does the merino you’d wear in a blazer differ to the worsted you’d have a suit made up out of? Are there any specific bunches you’d recommend for it? No, I don’t have specific bunches off the top of my head. So would a navy woollen flannel would work as a blazer? I’m still a little confused ha! Would Harrison’s moonbeam work? I know online swatches are hard but was thinking a plain navy like this? Thanks so much! Great posts over the past weeks in addition to the coming excellent initiative about a very import issue! As to this specific post, I just want to know whether adding suede elbow patches to your navy blazer , as you’ve suggested, wouldn’t affect its formality by making it a little bit more casual. I wouldn’t have asked this question, if its fabric were a tweed or anything else. For sure, there is no viable alternative. Hey Simon, is there an equivalent in precious fibres for use in summer/tropical countries? The supply of Vicuna is obviously artificially restricted and I wonder for how long. The prices of the vicuna wool are as if the animal is still rare, which is simply not true anymore. Vicuna is neither rare nor endangered anymore and the absurd price is not justified. If the market was more liberal, the prices would have dropped drastically. The high prices could last a long time. Gold remains expensive and yet it is mined by the ton. It has not been rare for a very long time. And some brands (eg. Loro Piana) have made significant investments in marketing this above other yarns, that’s why it is not in their interest to reduce prices now. Loro Piana was (or maybe still is) producing yarns out of much more rare and precious animals, but the quality increase is not really visible to humans, as production and finishing methods have significantly improved over the years. It all boils down to marketing. Lori Piana are the ones cheifly responsable for the saving of the vicuna animal and invested considerable amounts to their conservation, therefore I consider the increased price justified. 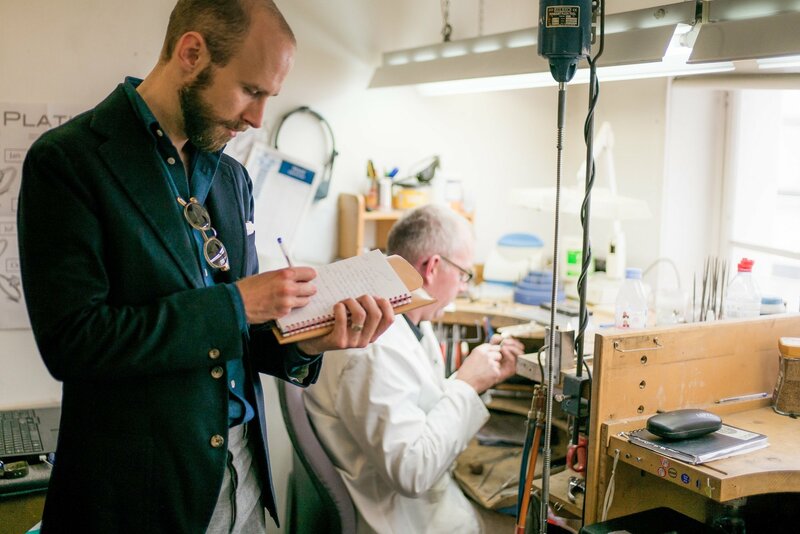 On the topic of caring for cashmere – I have a navy cashmere blazer, which I love the feel of, but has started to go a bit “hairy” (sorry, couldn’t think of a better way to describe it – some fibres being elongated, particularly on the edges and the front roll of the jacket. It is not pilling the way I understand it on a woolen jumper). Is this normal or does it say something about the quality of the cashmere? Will brushing the jacket help? Should I trim the extended fibres? I have nine cashmere jackets (is four in navy, in different weights, over the top? Yes.). They are all Loro Piana and I’ve worn them exclusively for seven years or more. None show any signs of wear, even the summer cashmeres. All I can suggest is get the best fabric. None of my jackets or suits has ever been dry cleaned BTW. They are all MTM and that suits me perfectly. Once you experience cashmere you may find it hard to turn back. Vicuna…..Always makes me think of the scene from the film Sunset Boulevard, when Norma takes Joe shopping for some clothes. A rather slick sales representative points out an overcoat and reveals it is made of vicuna. When Joe says it sounds extravagant (and expensive), the Sales Rep it shouldn’t matter as “the lady is paying for it”……Joe gets the coat…. I was in high school at the time (the movie was on afternoon television decades after it was made – no, I didn’t see it when it first came out!) and I remember having to look up exactly what vicuna was. I’m looking into a commission for an overcoat, a bit of a tweak on a polo. Any thoughts/recommendations on fabric choice? Ideally something that is regularly wearable through a London winter (so probably not a light tan camel!) with enough texture to be visually interesting. Any recommendations or advice on where to look much appreciated. If you want versatility then probably go for a navy or grey. If you want visual interest, that will be easier in grey, for example a herringbone. And go for 100% wools unless you already have some good overcoats and this one won’t get heavy wear. How about a casentino in 100% wool? I think they do sometimes come with a little bit of more exotic in the mix like cashmere or alpaca but these would be less durable (?). Also any thoughts on where I might be able able to source casentino would be much appreciated. Casentino would be nice, though of course it’s a very particular look. Caccioppolli used to offer it in their overcoatings, but I don’t think they do anymore. I don’t know any others, sorry. Any thoughts, or preferences? Even some of the YouTube videos (ranging from the Loro Piana piece, through National Geographic) are undecided…. For anyone interested in cashmere Derek Guy (Dieworkwear) has just published a great article on the subject. More focussed on kinitwear but enlightening nonetheless. I’ve lived in Mongolia on and off for the last nine years, and as a result my wardrobe is full of cashmere items – mostly scarves because I’m a skinflint, and I prefer hard wearing fabrics for jackets and the like. My absolute favourite cashmere item, though, is a sleeping mask from Gobi Cashmere. I stumbled on it a few years ago at their outlet store in Ulaanbaatar, and since it was reduced to about $30 I thought it was worth giving it a try. It’s bloody amazing. Never take a flight without it, and I’m out like a light by takeoff. I’ve found a plain brown Loro piana cashmere (300g) that I really love (I think it might be from the same bunch as your oatmeal cashmere because it has the same twill texture) but it doesn’t have any real pattern or surface interest. Would this be too smooth for dark jeans or cotton trousers? I would’ve thought it would quite versatile with different colour trousers in any case? I’m have a favorite suit of mine made form a worsted wool/cashmere/silk cloth from H&S, its very light at only 240g/7oz and I try wear it infrequently. Would any of your above care advice change for a cloth of this blend & weight? Still trying to understand the durability of camel hair. Just purchased Ralph Lauren polo coat in camel hair but I’m concerned that it will wear quickly. I’ll wear it 3 or 4 times per month. How long before it shows wear at cuffs, collar? With that kind of wear, you should be fine. Years I’d imagine. Is it possible you could specifically list one or two cashmere fabrics (whether it be Loro Piana, Draper or any other respected maker) that would be appropriate for a double-breasted Navy chesterfield style overcoat? I need to choose the cashmere swatch somewhat soon and I’d be very grateful if you narrowed the choices. I have multiple long coats and trench coats for various weather scenarios – so this cashmere will be for special winter occasions in Europe, Canada and northern US. Usually with a suit underneath. I’ll take good care of it, brush it, hang it carefully, etc. I want it to last 20+ years and age gracefully. I know the tailor will show me multiple books with cashmere choices but I’d like to go in to this process already knowing that I have a target fabric and weight in mind. I don’t want to rely on simple hand feeling the fabric and making a quick decision. What exact cashmere (maker, weight, etc) would you choose for a traditional/formal DB overcoat given the lessons you learned? Also for a Chesterfield collar, what complimentary fabric would you choose? Black velvet or something else? Many thanks!! Hopefully we will do a version of our Linen feature sometime soon which will review all the bunches available. In the meantime, feel confident that you’re on safe ground given you already know what colour and fibre you want, and this piece gives good guidance on weight. You can’t go much wrong after that. Down to two choices for my 100% cashmere long overcoat: both are Loro Piana and selling at close-out price. One choice is 23 ounce ‘double-facing’ (Navy blue) cashmere. Other choice is 19 ounce ‘single’ dark grey cashmere. Both are appropriate color choices and the tailor indicated he could work equally well with either material. The double facing is slightly more expensive. Any thoughts on double-facing cashmere besides the interior lining issue? Any thoughts on baby camel hair for sport coats? Thanks – I was considering it as a more durable alternative to cashmere so it may be a good option to consider.